Are you seeking employment in a high-demand field with opportunity for advancement? Human resources may be the career for you. According to the Bureau of Labor Statistics, jobs in the human resources field are expected to grow seven percent between 2016 to 2026. Human resources specialists are needed to handle the increasingly complex employment laws and healthcare coverage options. This course will help you master the skills needed to advance in your human resources career and prepares you to take the Human Resource Certification Institute’s (HRCI) Professional in Human Resources (PHR) certification exam. The Human Resources Professional course prepares you for a career in human resources. This course explores the foundational aspects of HR, including human resource laws, hiring disciplines, and labor relations. You will learn industry-recognized practices that align with the Human Resource Certification Institute (HCRI) and the Society for Human Resource Management (SHRM). By the time you finish the course, you will be equipped to start your career in this growing field. Additionally, you will be prepared to take the HCRI’s Professional in Human Resources (PHR) certification exam. 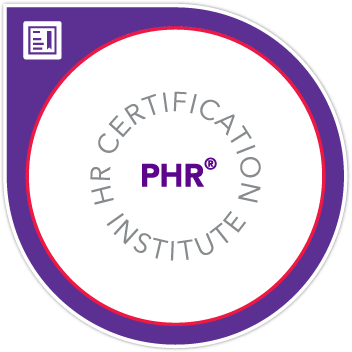 The PHR certification recognizes that an individual holds the knowledge and experience needed to excel in human resource management. You will also learn information useful to sitting for certification exams taken at more advanced stages in a human resources career, including the SHRM’s Certified Professional exam and the HRCI’s Associate Professional Human Resources exam. B. Chapter 2: What Is OSHA? C. Chapter 3: Knock, Knock, OSHA Is Here . . .
D. Chapter 4: What Is Discrimination? E. Chapter 5: Still More Numbers for the Government! B. Chapter 2: What Is Diversity—and Why Is It a Good Thing? F. Chapter 6: Let Your Employees Have a Life! There are no prerequisites for taking this course, other than basic computer knowledge. Anna Smith has a bachelor's degree in business administration from Spalding University and a master's degree in Management from Webster University. She is also a certified Senior Professional in Human Resources, a SHRM Senior Certified Professional, and she holds a Master Online Teaching certificate from the University of Illinois. 3. What if I don't have enough time to complete my courses within the time frame provided? All the materials needed are included, and their cost will be covered by your tuition. Upon enrollment, ed2go will ship all materials via ground service. ed2go courses are non-credit, so they do not qualify for federal aid. However, vocational rehab and workforce development boards in some states will pay for qualified students to take our courses. Additionally, some students may qualify for financial assistance if they meet certain requirements. This course will provide you with the skills needed to obtain an entry-level position in most cases. We do not offer direct job placement services, but our instructors and career counselors will help you build your resume and provide advice on starting your career. Instructors can also be used as a professional reference upon course completion. However, you should always research the job market in your area before registering for a course. All of our course instructors are successful working professionals in the fields in which they teach. The instructor is available by email to answer any questions you may have and provide one-on-one feedback on your performance. Our Advanced Career Training courses are open enrollment, meaning you can register and start learning as soon as you are ready. Please note that once the course curriculum is accessed online or through submission of a material shipment confirmation, refunds cannot be issued. 13. Does this course come with an internship? No, but you will receive insight on how to obtain an internship or externship. 14. Do I need experience in human resources to take this course? No. You do not need to have experience in human resources to take this course. However, you will need experience as a human resources representative to take the PHR exam, administered by the Human Resource Certification Institute (HRCI). 15. Does this course prepare for certification? Yes, this course prepares you to sit for the Human Resource Certification Institute’s PHR exam. However, you will need experience in the human resources field before you are eligible to take this exam. Please reference the Prerequisites section for more information. 16. Why is certification important? Obtaining certification shows that you are dedicated to advancing in your career. Many organizations consider the certified Human Resources Professional to be motivated and knowledgeable, giving them a competitive edge in the field. The facilitator was very knowledgeable. Any support, that I did need, was timely. Because of my work schedule, being able to acquire knowledge and bullets in my resume, on-line is invaluable to me. I would recommend it to anyone. My experience with the professor was great. I received great insight from here while working in my current position. She was very helpful and gave great advice. Ms. Smith was a great facilitator. I enjoyed learning and building a foundation for Human Resources. Anna Smith was very helpful. I enjoyed the fact that I could work on the course at my own pace. I like the well rounded approach of the course content. It covered a little bit of everything. My facilitator was very knowledgeable, as well as wonderfully responsive and helpful. My experience with this course was very knowledgeable I would recommend it to all my friends and family. I love it and I will continue to take more courses in the near future.